Description: The California Myotis (Myotis californicus) has a pelage that varies, but is consistently a light red-brown. It’s ear and face are black. Average length is 82 mm and approximate weight is 3-5 grams. 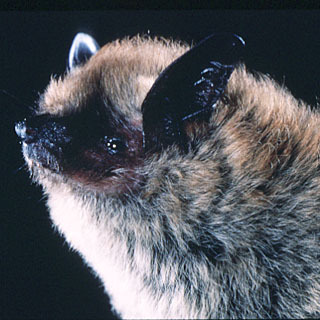 About the California Myotis: This bat is found often in buildings and rock fissures. A hibernating species, it roosts in colonies up to 25 individuals. Females give birth to one pup. They typically forage, or search for food, close to the ground.